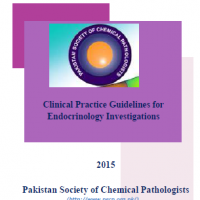 This is a publication of Pakistan Society of Chemical Pathologist (PSCP). All rights are reserved. No part of this booklet may be reproduced without written and explicit prior permission of PSCP. This booklet is distributed to the health care providers free of cost and it is NOT for sale. Disclaimer: All efforts have been made to include most recent and reliable information in this booklet but knowledge and best practice in this field keeps on changing very rapidly. So it is the responsibility of the health practitioners to make decision regarding patient care based on their patient experience and any further update on the subject. Authors of the booklet declare no conflict of interest of any sort or any nature.